Life outside the big city is what this website is all about! Louisville's a great place to visit, but I want to live where the grass is greener, the traffic disappears and the pace slows down to where you can enjoy life again. If you are looking for a new home in one of Louisville's more popular bedroom communities, you've found the right website! Browse to your heart's content among the best of Kentucky homes for sale in Spencer County, Shelby County, eastern Jefferson County and Mount Washington in Bullitt Co. When you're ready to go shopping for your new home just call Patty at 502-902-6078 and she'll be ready when you are! Our fast home search website is www.BestofKentuckyHomes.com It has houses, condos, farms, building lots and more listed for sale in the Spencer County, KY area, including Taylorsville, Crenshaw, Elk Creek, Little Mount, Mount Eden, Normandy, Rivals, Wakefield, Waterford and Yoder. If you're looking in Shelby County, Kentucky you can find listings in Shelbyville, Finchville, Simpsonville, Waddy and more. There are real estate listings from eastern Jefferson County (Fern Creek, Jeffersontown and Middletown) and Mt Washington, too. 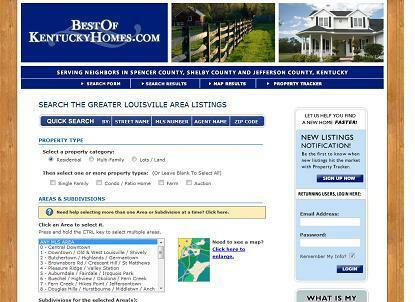 Our website is updated daily so you're always getting the best of Kentucky's new listings. Shop for your next home at your own pace through thousands of the Louisville area's best houses, condos and patio homes. Moving is an important decision to make. If you would like the help of a licensed expert in real estate listing and sales, give Patty a call at 502-902-6078. You'll be glad you did. *Need to know how much you can afford? We can help there, too. We have a list of very competitive, and very helpful lenders we will be glad to share with you! Buying a home is an exciting and complex adventure. It can also be a very time-consuming and costly one if you're not familiar with all aspects of the home buying process, or don't have all the best information and resources at hand. My specialty is representing the best interests of Spencer County and Louisville area home buyers. My comprehensive, fast and friendly service can save you time and money, as well as make the home shopping experience a lot more fun and less stressful. If you're like most people buying a home, itï¿½s the biggest investment youï¿½ll ever make. 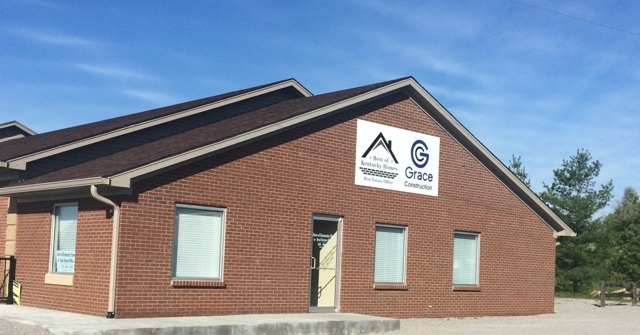 So whether you're buying your first home, your dream home or that farm youï¿½ve always wanted, take advantage of my years of experience as a local market expert for Spencer County, Louisville and the surrounding areas to make the most informed decisions you can when buying a new home? Your home is your largest financial asset for most families, and when you decide to sell home, it is a major decision that can involve a lot of preparation and hard work. When you're ready to sell it's important to have an experienced real estate professional handle the details. As an experienced real estate professional who has helped many Louisville and Spencer County residents sell their homes successfully, I know how to handle every aspect of the sales process - from online marketing and showcasing your home to making sure everything's signed, sealed and delivered by the date of closing. Providing you with professional, fast and friendly listing service is my top priority. So when you decide to sell your home, please contact me and let's get your home sold! 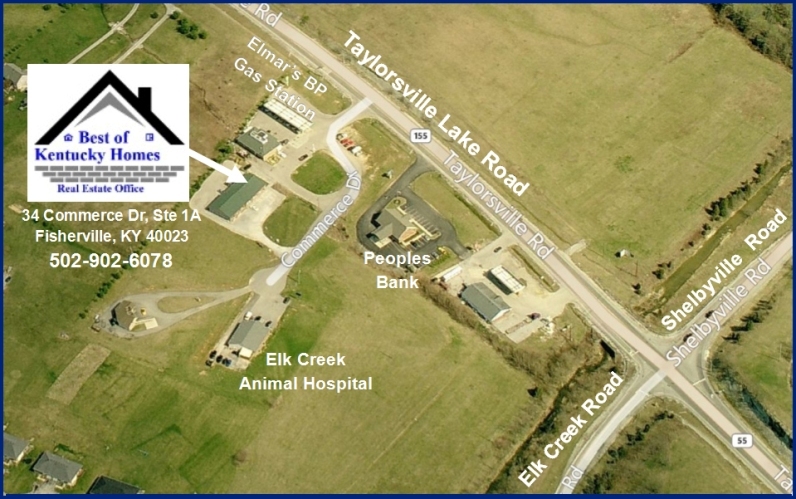 We are now located just off Taylorsville Lake Rd near Elk Creek Rd. Don't forget to wave! Here are some of the area's most popular link from all over Spencer, Shelby and Jefferson County. Restaurants in Spencer County - "You'll never go hungry in Spencer County!"